Everyone at 140 Aldersgate can now say they work at an award winning office. The British Institute of Facilities Management is the professional body for facilities management (FM); representing thousands of FM professionals worldwide. Their goal, basically, is to help create better workplaces. Their annual awards are the Oscars of the facilities management industry. 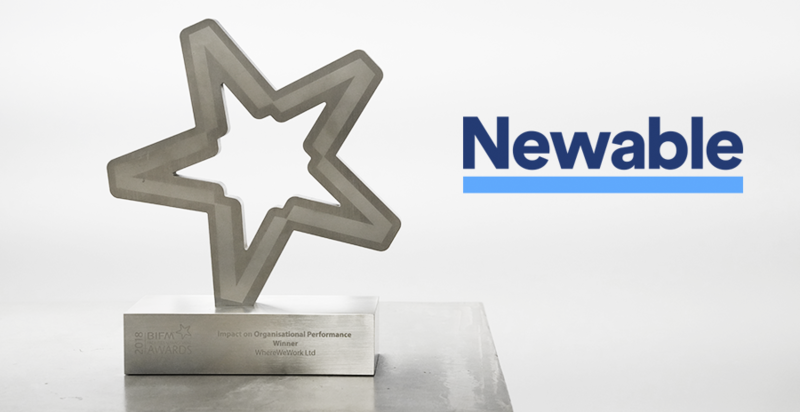 Newable and Where We Work, the FM partner who helped with all aspects of the move to 140 Aldersgate Street, were shortlisted for an award. The Impact on Organisational Performance category searches for best practice and innovation in the FM industry, showing significant contribution to the performance of the organisation and the resulting benefits for their shareholders, employees and customers. This maybe through a cultural change programme leading to; improved output and efficiency, possibly reduced cost, increased revenue and greater customer or employee satisfaction. The judges will be seeking submissions that are evidence based and results that have a long lasting impact on the organisation’s performance. Competiton was fierce as we were up against some giants of the industry including Skanska and CBRE. Boom! We only went and won. Well done everyone. Mike Walsh, Nick Wright, Ed Louttit, Gavin Holland and Lyca Amichia were honoured to represent you.